With the winter months upon us I felt it was a good time to write a blog post about my own catches during September, October and November. More client catch reports/stories from this period will follow in the coming weeks (I have just touched on them durng this post). In addition to breaking my personal best in September here I’ve managed a some short sessions – some of which have been successful both in daylight and darkness. Therefore, below is brief outline of how, when and where I have achieved the more significant catches, in addition to anything that I’ve learnt, new lures that I’ve ‘discovered’ or basically anything that I think might be useful to you. Confirming your instinct or gut feeling for a mark and receiving the reward for all the homework and effort you’ve put into it (by way of actually catching a bass from it) takes some beating in my book. Indeed, following a lot of time and effort, I almost have a template or blueprint of what constitutes a possible night fishing mark – very shallow, snag ridden and with pools, depressions or gullies set amongst the reef system. Importantly, there has to be a lot of life present (for example, crabs, gobies, shrimps) as seemingly, this is what consistently attracts the bass very close inshore. There are probably hundreds of these types of areas within the 15 miles of coastline that I concentrate on the most – and trust me I’ll certainly try to fish as many of them as I can in the future! But the mark I caught this 55cm bass from (on the 25th September) is a place that up until 6 months ago, I probably would have ignored – that is how quickly night lure fishing for bass has changed me! The bass below was the first one I’d caught from this tiny shingle cove that leads onto a very flat, relatively featureless (except the small boulders under which it’s teeming with bass fodder) expanse of flat rock – yet over high tide the bass appear to move in and just sit here. I’ve subsequently caught more bass this spot (and lost one that felt very, very decent) and every hit I’ve had has been very close (less than 5m) to the dry shingle. The 28th September was one of those peaceful, warm, tranquil autumn mornings – the type of which is very reminiscent of those first warm sunny days you get in late April/early May. After applying the sunscreen, I made my way out across the rocks and around to a secluded reef just as the flooding tide reached the midway point. It was just such a wonderful moment to be out bass lure fishing – sometimes it does just hit you and I know I am very fortunate to be able to consider this area as ‘home’. With only a short time available to fish, I was keen to maximise the opportunity. To me, this meant rotating through different lure types and casting into known bass holding areas such as the mouths of small gullies and close to underwater features. Under a blue sky and with very clear water I started off with a couple of shallow diving minnow lures whilst remaining as low in the possible to the water – so not to standout against the skyline. Admittedly, I would normally commence a session with a very subtle weedless soft plastic under bright/clear conditions, but with a tiny swell just about creating some more aerated water around the rocks I fancied a minnow might be attacked! One of the lures that I’d been using/testing is the new and competitively priced Savage Gear Jerk Minnow 145 SF. Weighing 14g and measuring 145mm they cast well and are extremely sandeel-like when retrieved on a medium-fast retrieve and/or twitched intermittently. And it was this very lure, in the Blue Sardine colour that attracted the dark backed brute of a bass below (measuring 58cm/around 4¾lb) just as the lure was brought over a weed-bed, at the tip of a rock formation running parallel to my stance. A very bright day didn’t deter this beast from ambushing what it thought was an unsuspecting sandeel, very close to the rocks, in some slightly aerated (white) water. All bass are beautiful creatures but in the bright early morning sunlight this fish really did put a smile on my face – it was the perfect way to spend a few hours and is proof that if you search out the quieter areas, decent bass can be caught at anytime of day. A beauty! This fantastically conditioned bass really wanted that ‘little fish’ and gave my new Daiwa reel a great workout! Very late or very early? My next successful session occurred very early on the 4th October – 0300 to be precise! On this calm, moonlit night I fished a relatively new mark with a friend of mine landing two bass (the largest at 56cm) on what has become one of my ‘go to’ lures – the pearl coloured Albie Snax. The interesting thing about this particular session was the very high, bright full Moon (see the release video below) illuminating the whole coastline that certainly didn’t appear to put the bass off feeding over a reef in shallow (3 – 4ft) water. Measuring 5″ and weighing 14g, the Albe Snax has been one of the finds of the season. – not just for me, but many other lure anglers. I love fishing with a 6″ white senko at night, but the ‘Snax’ with its slaloming action on a straight/linear slow-medium paced retrieve, with the rod up at between 30 – 45° has proved to be irresistible – often out fishing and out casting my regular senkos. The Lure Hub is also one of the few online stores where you can buy these brilliant, versatile lures. There are a couple of things to note in relation to these lures however. They can be rigged on the Super Snax 7/0 hooks or a mimimum (in my opinion) similar 6/0 weedless twistlock hooks – preferably with a wide gape. Furthermore, when you rig them onto the lure, ensure that the hook is very centrally positioned in line with the seam that you’ll see when you look at them closely. One other thing, these lures are fairly stiff or rigid therefore, to aid the hook up ratio I tend to wriggle and manoeuvre the lure several times around the gape of the hook to ensure it slides relatively easily (not loosely) around the hook when a fish takes it. Generally speaking, a bass over 1lb will not mess about with an Albie Snax and if you do get a knock, especially at close range, cast just beyond where you received the hit… You may just get lucky as I’ve had a couple of bass grab the lure properly on the second attempt when I’ve done this. I look shattered! And with good reason as I’d had about 3 hours sleep and it was 0400 in the morning when I connected with this 56cm bass under a full Moon. This is the kind of dedication required – as my clients are finding out! A successful client session here on the 9th October (he had two up to 54cm) was followed by me losing at very long-range a fish on the 12th October… It felt huge! I’ve never had a fish take line like it! Anyway enough on that one as it’s too painful to tell the full story! Around the middle of October ex-hurricane Ophelia and Storm Brian meant I had to reschedule a client session and I was unable to fish myself or guide until the 26th October when a client smashed his personal best bass with a lovely 59cm fish taken on a white senko (story/blog post to follow next week). On the 30th October I ventured out onto a new mark over the low tide period during the every small neap tides, just to test things out with future clients in mind. I was rewarded with a small bass on a white senko, so it was useful and confirmed a theory that the bass might be waiting beyond the reef, over a patch of sand whenthe tide was further out. Things did go quiet for a week when the weather remained on the cold side (we had some early morning frosts here in south Devon) but I was confident the bass were still around. In the very early hours of the 14th November, on a very dark moonless night, when the only sound to be heard was an owl in the distance, I ventured out with a mate of mine (and former client) George. I managed to land three bass, the largest at 63cm all on what was now becoming, the incredibly consistent Albie Snax. Catching bass like this is hugely satisfying – which is just what you need when you’ve had 2 hours sleep before venturing out in the dead of night… It’s bloody exciting though and well worth the effort! At 63cm (around 6lb) this bass was the largest of the night during a pretty hectic session for me with lots of hits – November is always a great month for bass lure fishing. My friend George took this picture on my new camera (Nikon D5000 SLR) as I was struggling slightly with the self-timer… Cheers George! I love filming these majestic predators returning to their haunts – attempting to keep the head-torch on them whilst filming isn’t easy, but if you can find a nice shallow, sheltered spot to return safely them then it makes the experience even more memorable. I had another client catch a 58cm bass in darkness, this time on a white senko (sorry! Story to come!) very early in the morning on the 17th November. Ideal night fishing conditions (calm, settled) were also present last weekend (18/19 November) but with family commitments etc. I just didn’t get the chance to go fishing until Tuesday (21st). As per most of my solo fishing sessions, I only had a couple of hours available, but I was extremely keen to head out as it was forecast to be a lovely warm morning before the weather changed to very windy conditions that evening and into Wednesday. With a high tide of 0730, I decided to fish the middle hours of the ebb, when the tide would be at its strongest over a stretch of coastline very local to me. With pure sand just beyond an area reef (encompassing some tasty parallel running gullies) the 2 – 3ft swell was breaking invitingly around the larger rocks that were starting to become exposed. Needing something that would cast a long way (40m+) into the zone where the waves were breaking and the reef met the sand, I attached a Savage Gear Jerk Minnow 175 – quite a meaty lure admittedly. Furthermore, I do try to ‘match the hatch’ when I’m lure fishing and as there aren’t any sandeels around in November I was somewhat dubious about using this lure. But with the water quite murky (10 – 14″ of clarity) it seemed perfectly plausible that a bass would see a glimmer, a flash or some sudden movement and just hit it! The Savage Gear Jerk Minnow 175 25g casts like a missile and is the ideal weapon for those days when casting into the surf is required. Second cast, out into the breakers and just as the lure was about to ‘swim’ over the reef it was nailed really hard by the 50cm bass below. Around 20 minutes later I caught a much smaller bass on the same lure – my lure box is beginning to look a little clustered with all these new bass catchers! Late November mornings don’t get much better than this – warm, settled and with a great chance of connecting with a bass or two. I’m so glad I remembered to chuck the Go-Pro into my own fishing bag for once (it normally resides in my client bag) as I was able to capture this short clip of the fish above being safely returned. I’m very excited about the prospects for December and beyond. The weather is due to turn brighter and colder next week with a northerly flow therefore, it will serve to flatten the sea out (meaning it’ll also clear) along large swathes of the south Devon coastline. All of which which means one thing to me – night fishing! I would love to end the season with a monster bass – maybe even a double! Now wouldn’t that be nice! In my next post I will highlight the EU proposals concerning bass fishing/conservation measures in 2018. Previous Client Catches – Moonlight, bites and bass! 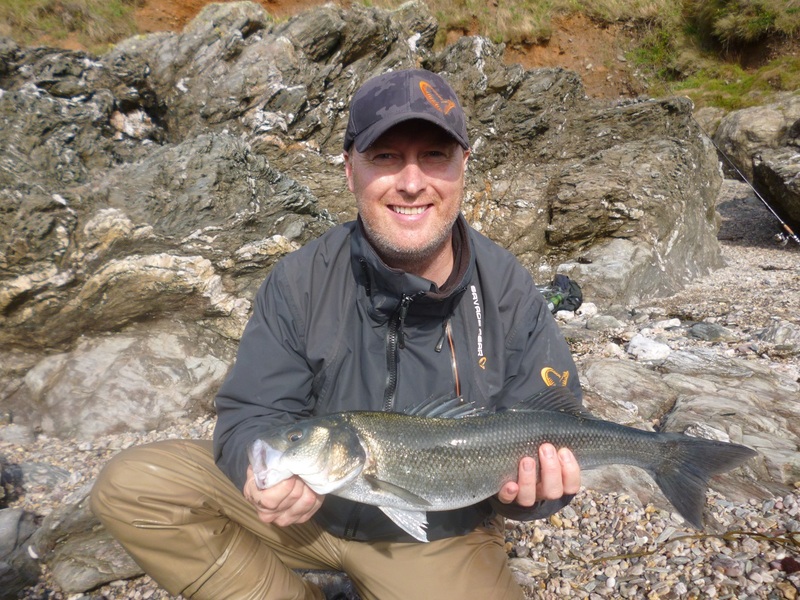 Next Client Catches – Clarity, confirmation and a cracker of a bass!